NASA has all of a sudden (so they say) taken great interest in the massive geoglyphs that are spread across the steppe of northern Kazakhstan. The exact same area, which may have between 50 and 100 ancient geoglyph formations, is quite coincidentally located between what are known as the Nazca Lines of Kazakhstan, which are to be distinguished from the Nazca Lines of Peru. 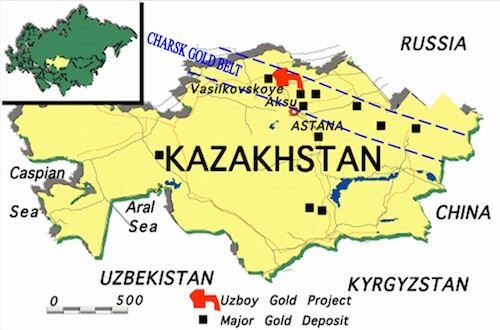 What also happens to lie between the “Nazca Lines” of the northern Kazakh steppe but the well-known Charsk Gold Belt. The Charsk is not any ordinary gold mining region. It is rich in gold that is quite easy to mine unlike many of the deep-under-earth and cost-prohibitive mines of South Africa and elsewhere. What’s the point? There are actually two key points. First, that Kazakhstan shares a longer border with Russia than any other former Soviet republic or communist satellite of the old USSR. Secondly, that the Anglo-American Axis* is direly short of gold, as in the hard precious metal. This extremely inconvenient truth will become more manifest during the next 12 months … to the great chagrin of many depositors and client states of both the USA and UK. *The Anglo-American Axis is represented, first and foremost, by the major English-speaking countries of the world: USA, UK, Canada, Australia, New Zealand and Israel. The European member nations of NATO, such as Germany, France, Italy, Spain, Portugal, Belgium, Luxembourg and the Netherlands are also closely aligned with the AAA as are all the Scandinavian countries. So are the Asian Pacific Rim nations of Japan, South Korea, Taiwan and the Philippines. Saudi Arabia, Egypt, Pakistan, Kuwait, Jordan, Bahrain, United Arab Emirates, and Qatar also owe their allegiance to the AAA but some of these may be changing. The World Shadow Government is an ultra-secret, supranational organization which completely controls the Anglo-American Axis, as well as the European Union, NATO, among many other institutional entities which constitute the Global Control Matrix. Ancient geoglyphs — such as the Nazca Lines in Peru or the megalith structures in the Ural Mountains — captivate the world every time someone finds them. 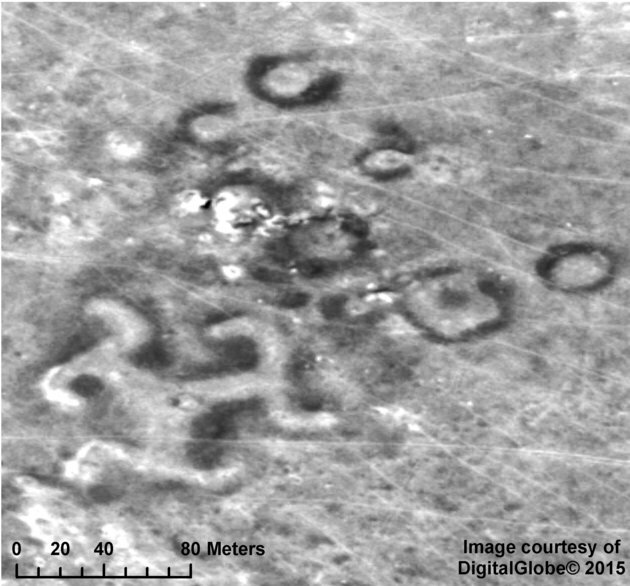 In fact, one group of geoglyphs is so fascinating, NASA scientists have decided to study it from space. 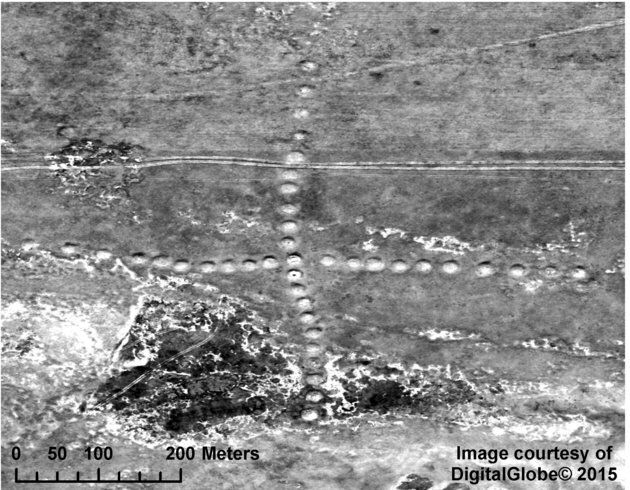 The space agency is officially beginning to investigate the Steppe Geoglyphs, a group of more than 200 giant squares, lines, and rings formed by dirt mounds in the Turgai area of northern Kazakhstan. NASA released photos of the formations two weeks ago, and the space agency will continue to capture more images as it attempts to help researchers understand what the shapes may have meant to ancient people. 100 mounds of dirt, is named after a nearby village in Kazakhstan. 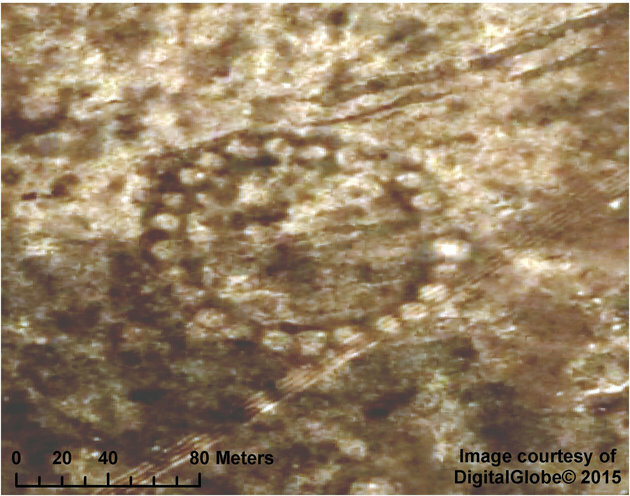 DIGITAL GLOBE/ NASAThe Bestamskoe Ring, one of the Steppe Geoglyphs. Archeology enthusiast Dmitriy Dey happened upon the formations while he was searching Google Earth for pyramids, The New York Times reported. Each individual mound in the formation is about three feet high and 40 feet wide.Some of the mounds may be 8,000 years old, say researchers who have tested how long ago the minerals in the dirt were last exposed to sunlight.Photographing the Steppe Geoglyphs is now on the official to-do list for NASA’s International Space Station. To complete the project, the space agency also has teamed up with DigitalGlobe, a private company that takes high-resolution photos of the Earth with satellites. DIGITAL GLOBE/ NASABig Ashutastinsky Cross, another geoglyph. “Astronauts on the ISS like to be kept busy looking at interesting things on Earth,” Tucker said. “NASA imagery has likely been used to study these types of formations in the past. But now we have teamed with DigitalGlobe. We’re about to get 50 to 60 images from them to work from there.”The glyphs are 300 to 1,300 feet across, so they can only be fully appreciated from a distant satellite’s perspective. design element in ancient art. 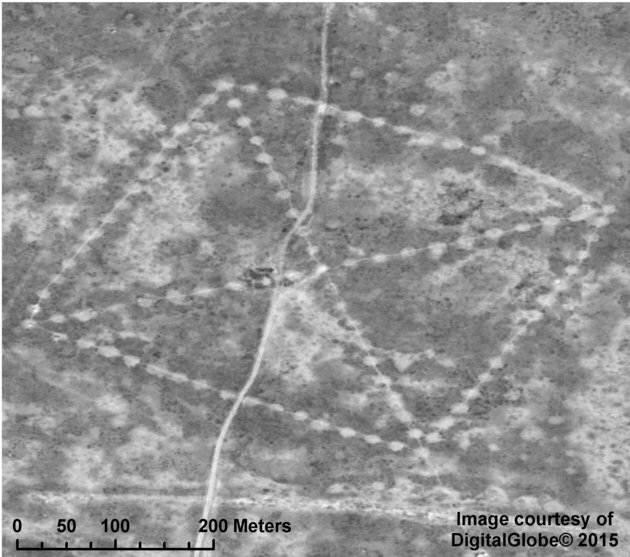 Dey, who rediscovered the glyphs, thinks they were built by members of the Mahandzhar culture that lived in the area between 7000 and 5000 B.C.Other scientists aren’t sure whether such nomadic cultures would have stayed put long enoughto design and execute such sweeping projects, according to The New York Times. And it’s still a mystery why anyone would build the glyphs in the first place.”These alignments might have something to do with the calendar, to tell where the movement of the sun was so that the people would have some idea of when the spring or fall was coming, which might be important for their animal husbandry,” Tucker told HuffPost.